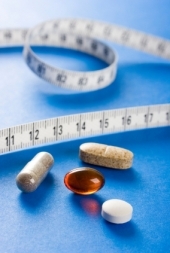 What are herbal diet pills? Herbal diet pills are 'slimming' pills made from natural ingredients that are meant to help you lose weight. They often contain ingredients designed to speed up the metabolism - such as caffeine and green tea extract - or suppress the appetite by including ingredients such as alfalfa and conjugated linoleic acid (CLA). This effortless guide to weight loss sounds very appealing, but experts are divided on whether they actually work or not. Some of the best known examples of herbal diet pills include Zotrim, Adios, Vitabiotics Dietrim, HealthAid Slim Rite, Boots Alternative Diet Aid and Bio Synergy Perfect Fat Burner. All these examples are available from chemists or health food stores. You should, however, avoid diet pills that are only sold over the internet as they may not be subject to the same standards regulations as those sold in shops. Any licensed herbal medicine does have to have a certain level of proof of effectiveness. Adois and Zotrim are two such examples. So they are certainly worth a try, and taking something that might help your diet always provides a huge psychological boost. But beware of treating them as a 'wonder-cure' for being overweight. Make sure you keep eating healthily and exercising regularly because diet pills should complement rather than replace a fitness regime. However, most herbal pills and patches have very little evidence going for them at all and are probably just a waste of money. Some Nutracheck users have complained of stomach aches and constipation after using diet pills so it's also worth checking with your GP before you start taking anything. A cheaper way to lose weight is to make sure you are getting 2-3 portions of low fat dairy products a day, as there is emerging evidence that this can help weight loss by increasing the amount of fat you excrete. Overall, there's no escaping the fact that the best way to lose weight is to exercise more and eat healthily in moderation. It's not as easy as popping pills, but it does guarantee results!